Wife Elizabeth Sutherland died 9th June 1834 aged 40. 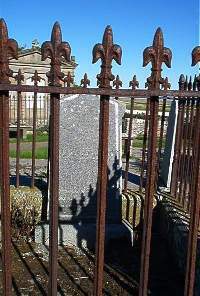 Daughter Elizabeth Sutherland drowned at Nova Scotia November 1832 aged 16. The following children died of smallpox August 1833 after their return from America. Margaret Sutherland died aged 14. This stone is placed here by Dr Sutherland of Natal South Africa and George W Sutherland surgeon RN their sons as a tribute of respect to dutiful parents.